When Jeffrey Orkin started the Urban Hydro Project, he knew he wanted to test the waters of hydroponic growing on a small scale, but didn’t know exactly what the end result would be—until now. Orkin has officially made the move from small-scale hydroponic experimenter to full-scale hydroponic entrepreneur with the creation of Greener Roots Farm. Orkin started the Urban Hydro Project in a 135 square foot utility room on the roof of a condo in downtown Nashville. For Greener Roots Farm, he plans to scale up significantly. 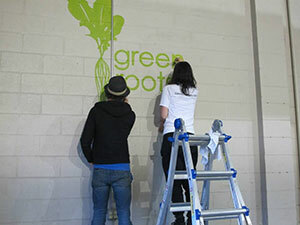 Orkin is currently finishing the build-out on a hydroponic farm in a 6,000 square foot space. “I realized that if I was going to take this to the next level I wanted something that spoke more to what I am doing, which is farming, and the fact that it is more sustainable—a greener product. From the evolution of that came ‘Greener Roots Farm,’” says Orkin. Greener Roots Farm will use a commercial custom fabricated hydroponic growing technique to grow herbs and leafy greens on a large scale. Orkin says they may grow some specialty items as well depending on the demands of their customers. According to Orkin, Greener Roots Farm will sell mainly to wholesale customers initially, but will eventually market some packaged products in grocery stores and move into direct to consumer sales. In the Urban Hydro Project, Orkin placed a heavy emphasis on educating the community about urban farming, and he plans to continue this educational component as he transitions to Greener Roots Farm. He recently built a permanent hydroponic system outside the pre-k classrooms at the YMCA in east Nashville and had the pre-k children plant the seeds. Within this system Orkin set up two different lighting techniques, so the kids could see how lighting effects crop growth. He also plans to add educational signage so those passing by can learn about hydroponics as well. “Education is still a key component of what we want to be doing in the community. I’m hoping to develop more and more of that as we move forward,” says Orkin. Despite any ambitions related to sales and education, at this point Orkin is mainly concerned with getting his system functioning and his business off the ground. Running a hydroponic operation at 6,000 square feet is much different than running one at 135 square feet, says Orkin, who has done most of the construction on his new hydroponic farm himself (with some help from his girlfriend and friends), while also working a full-time job. “It’s a lot of long nights and very long weekends trying to get it all put together,” says Orkin. Orkin hopes his hard work will pay off in the next couple of months when he officially begins selling Greener Roots produce. Once he gets the company started and on stable ground he hopes to venture into other forms of indoor farming, namely aquaponics. “My hope for the future is that we combine aquaponics and hydroponics and expand so we’re at capacity in the space,” says Orkin. Orkin sees Greener Roots Farm having a greater impact on the Nashville local foods scene both through sales of its product and its educational endeavors. He is grateful to finally be realizing his dream of starting a hydroponic farm, a dream that seemed very far away when he started Urban Hydro Project. “It’s an evolution. It’s been a process. There’s been a lot of learning along the way and a lot of trial and error with heavy emphasis on the error at times, but I think that’s how you learn and grow and get to this point,” says Orkin.